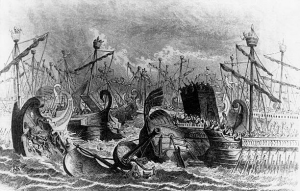 The Battle of the Aegates was fought off the Aegadian Islands, off the western coast of the island of Sicily on 10 March 241 BC. It was the final naval battle fought between the fleets of Carthage and the Roman Republic during the First Punic War. The result was a decisive Roman victory which forced an end to the protracted conflict, to the advantage of Rome. From 242 BC Rome eventually decided to build another fleet and regain naval supremacy, as the ships it had possessed at the beginning of the First Punic War had been largely destroyed in the Battle of Drepana and in the storm that followed. The new fleet was completed in 242 BC and entrusted to the consul Gaius Lutatius Catulus, assisted by the praetor Quintus Valerius Falto. The reversals of fortune and difficulties suffered in past naval defeats provided invaluable acquired experience. The Roman ships were now more resistant to adverse weather conditions, with the corvus having been abandoned. Catulus and Falto also endeavoured to drill the crews in manoeuvres and exercises before leaving secure waters. The result was a fleet at the peak of condition and fighting ability. In Carthage, meanwhile, the news of enemy activity was not left unanswered. A new Carthaginian fleet was also built, numbering about 250 warships (although probably undermanned), and launched in the Mediterranean under the command of Hanno. Catulus resumed the siege of the two Sicilian ports of Lilybaeum (at the western tip of Sicily, now called Marsala) and Drepana, and by blockading the harbours cut the connection to Carthage. The intent was seemingly to cut Hamilcar Barca’s supply and communication lines. For the rest of the year Catulus waited for the Carthaginian response. The senate granted him a proconsulship for 241 BC. The Carthaginian fleet arrived to relieve the blockade the following year (241 BC). Hanno called a halt near the Aegates Islands to wait for a favourable breeze that would speed him to Lilybaeum. However, the Carthaginian fleet was spotted by Roman scouts and Catulus abandoned the blockade to meet his enemy. On the morning of March 10, the wind favoured the Carthaginians and Hanno immediately set sail. Catulus measured the risk of attacking with the wind in his bow versus the risk of letting Hanno reach Sicily to relieve Hamilcar Barca and Lilybaeum. Despite unfavourable conditions, the proconsul decided to intercept the Carthaginians and ordered his fleet to prepare for battle. He had the Roman ships stripped of their masts, sails and other unnecessary equipment in order to make them more seaworthy in the rough conditions. Catulus himself was unable to join the actual battle because of injuries suffered in an earlier engagement, so in the actual battle the ships were commanded by his second in command, Falto. In the ensuing battle the Romans enjoyed a far greater mobility, since their vessels were carrying only the bare necessities, while the Carthaginians were burdened with men, equipment and provisions. The Carthaginian crews were also hurriedly levied and inexperienced. The Romans quickly gained the upper hand, using their ships’ greater manoeuvrability to ram the enemy vessels. The Romans lost 30 ships sunk and another 50 damaged. 50 Carthaginian ships were sunk, 20 of them with all hands, and 70 captured along with 4,040 or 6,000 men. The rest were saved only by an abrupt change in the direction of the wind, allowing them to flee from the Romans. Upon achieving decisive victory over the Carthaginian fleet, Catulus continued the land operations in Sicily against Lilybaeum, Eryx and Drepana defended by Hamilcar Barca and his army. The Carthaginian senate was reluctant to wage the war further by allocating the resources necessary to have another fleet built and manned. 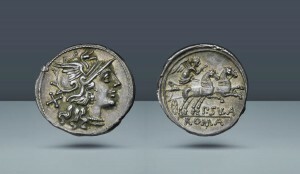 They ordered Hamilcar to negotiate a peace treaty with the Romans, which he left up to his subordinate commander Gesco. The Treaty of Lutatius was signed with conditions unfavourable to Carthage and brought the First Punic War to its end.